This weekend BP are carrying out two steps that will move the process of reducing the oil flow, and killing the well further forward. In fact, should the new sealing cap be placed over the well by Monday, then, with the new connections that are then to be made, there may well be no more oil flowing into the Gulf from shortly after that new collection system becomes fully effective. There are two parts to the process. 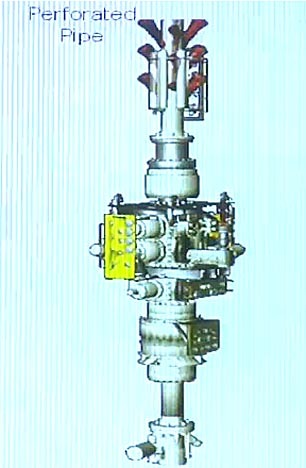 The more immediate part, that would have been in place, except for the bad weather, is the connecting of the flow from the kill ports on the BOP to the floating riser and the Helix Producer. At the same time the old riser section is being removed from the top of the well. 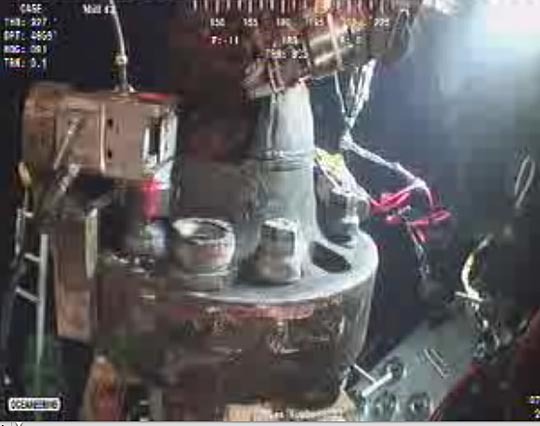 At the moment (9:15 pm Saturday evening) the ROVs from the Ocean Intervention are working on continuing to loosen the bolts on the riser flange. The box to the left has just been brought to the riser by Ocean Intervention ROV2, and this view is from ROV1. (Skandi ROV1 also appears to be monitoring the operation). 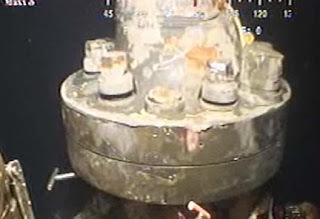 The view from ROV1 also shows, intermittently, one of the two pipe segments inside the riser. Kent Wells has described the process that is being carried out, noting that as the testing of the new cap proceeds, once it is installed, it might be possible to shut the well in. The flex joint has been straightened and blocked into place, and is aligned with the BOP. And the cap itself is a much more complex structure than had originally been discussed. It will also be installed in a number of stages, and I will use Kent Wells illustrations and comments to walk through this. 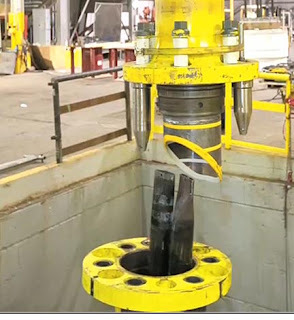 There are a couple of tools that have been developed to split the two halves of the flange after the bolts have been removed – the initial one will be fielded from the Inspiration drillship, and will fit around the flange, so that the top segment can be just lifted off. This will expose the two segments of drill pipe that are sticking out of the BOP, and so these will then be strapped together, so that they will fit within the transition spool. 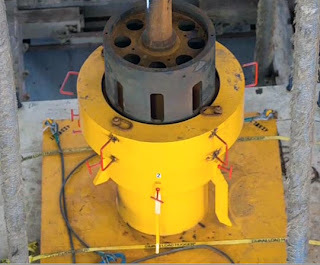 A guide shoe and positioning pins will be used to help lower this in place, and then the ROVs will bolt the 12 ft flange transition spool (the yellow segment) to the top of the old BOP. The 18-ft Lower Capping stack will now be lowered, on drill pipe, to fit on top of the transition spool. It sits on the HC connector, and is fitted with rams to control or stop the flow, and connectors that will allow feed of the oil to the different risers that will carry it from the well to the surface vessels. 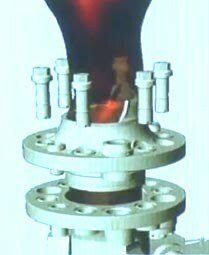 The capping stack has a perforated pipe at the top, and initially oil and gas will issue from that pipe, once the stack is locked in place. At the moment there is some doubt as to whether the fixtures on the top of the well, and the well itself, can hold pressure. 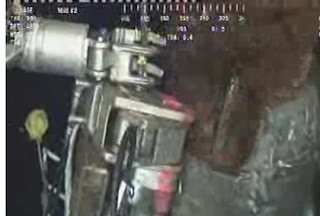 In other words if they seal off the well, will the internal pressure rupture one of the casings or the BOP. 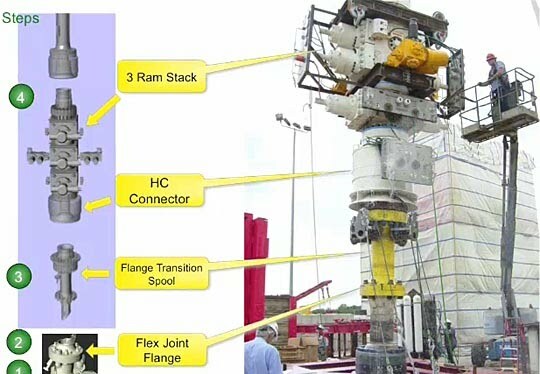 With the capping stack, with its control rams in place, the well can be gradually shut-in, while pressure and strains in the system are monitored. The flows can possibly be reduced, diverted to the surface vessels, or even, if the results are favorable, even completely shut down. There is an animation of the process, that was put together to allow the teams who will be doing this, to be trained in the assembly of the system. BP currently projects that it is going to take 4 – 7 days. And at the moment the Ocean Intervention ROV2 is cleaning off the side of the flange, so that the joint can be seen. (The wire brush is rotating so you can’t see the strands). And at this stage, it looks as though they have the bolts loosened - vide the one above the brush, and these below, which appear partly backed out and thus we may already be waiting for the separation tool to come down and remove the old riser. 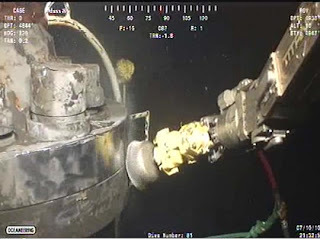 Then the transition spool (under the BOA ROV control) will be moved into place. We will wait and see how this unfolds as the day progresses.